Putting money into your Roth IRA can be difficult sometimes, but here are some examples of people who have hacked the system and created immense wealth simply by saving. The government keeps detailed statistics on its citizens, some of which make headlines but most of which go unnoticed. One statistic recently caught my attention and particularly the number 314. Why 314? Because there are at least 314 people with Individual Retirement Accounts with balances over $25,000,000. Let that sink in for a moment. Over 314 people have IRAs with more than $25 million dollars. You might be asking yourself how someone could have a $25,000,000 IRA when the contribution limits amount to only $275,000 during an average career? Even the more generous contributions under the SEP-IRA can’t explain balances of this size. Let’s see if we can build an account balance that large. First, let’s imagine that a 1-year-old opens an IRA and makes the maximum contribution through age 80. How much money would they have? Turns out that gets you about $17,641,918 if you get an average market return of 7% each year. Not bad, but also highly unrealistic since you need earned income to be eligible to contribute to an IRA. 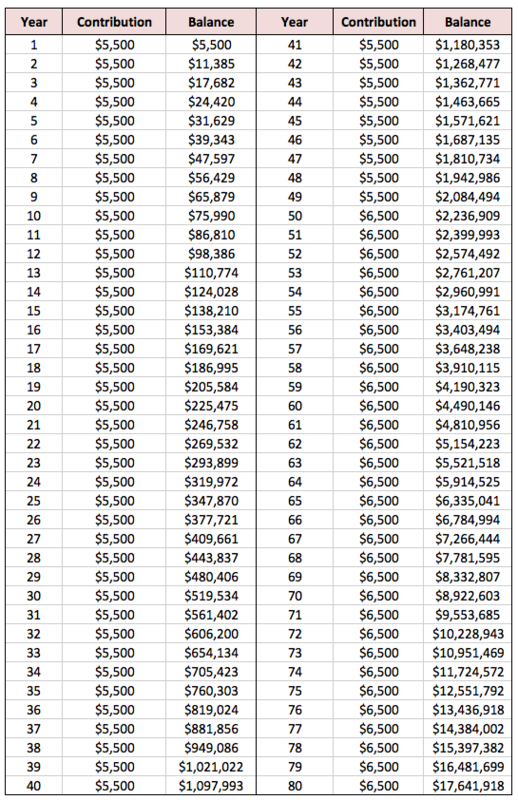 Assuming a more realistic scenario, if someone contributed the maximum amount from age 18 until age 70 they would only end up with a paltry $2,574,492. Hardly chump change, but not the $100,000,000 I promised in the headline. And yet according to the government numbers, these accounts exist. One case study we can look at is Peter Thiel. You may know him as the venture capitalist billionaire co-founder of Paypal. Or you may have read about how he funded Hulk Hogan’s lawsuit against Gawker. Either way, you probably didn’t know that he is a personal finance genius. It’s rumored that Peter Thiel, one of the early investors in Facebook, partially funded his investment in Facebook through his Roth IRA. If he put as little as $100,000 into Facebook back in 2004, he could easily have over $25,000,000 in a Roth IRA account by now. Notice that the government statistics don’t reveal whether the IRAs in question are traditional IRAs or Roth IRAs. I imagine that most of them are traditional IRAs with pre-tax money, if only because you can contribute over $50,000 to a SEP-IRA which makes the high balances more likely. However, I’m most intrigued at the thought of these megabalances being held in a Roth IRA. If you’re reading this blog and don’t know the tax benefits of Roth IRAs, then I have failed you, but it’s worth a quick recap: you invest with after-tax dollars but the money grows tax-free and is withdrawn tax-free. That means if you have a Roth IRA account with a balance over $25,000,000, all of that money is yours to keep. No more taxes. Talk about a smart investing move, right? 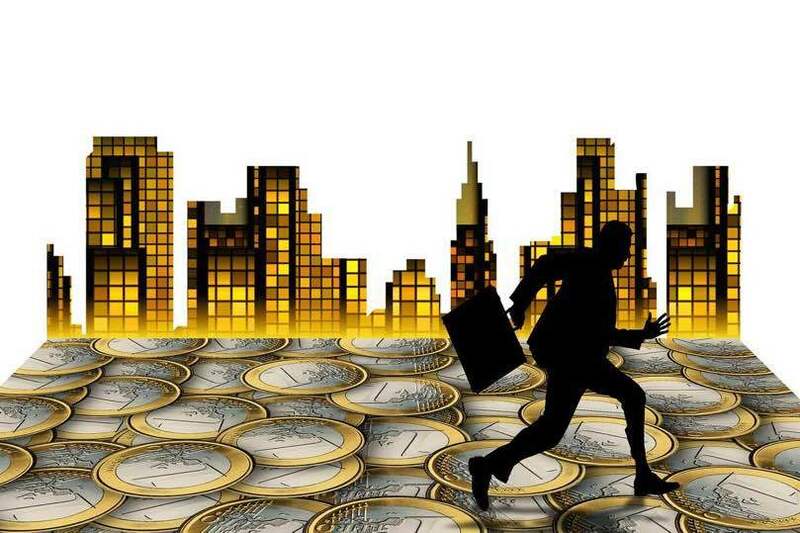 The trick to using your Roth IRA wrapper to invest in alternative investments like real estate, private company stock and intellectual property is to establish a self-directed IRA. Technically speaking, a self-directed IRA is not any different from any other IRA. It’s just that self-directed IRAs have a wider range of available investment options. Self-directed IRAs have been around since the IRA was created in 1974, but don’t receive the same level of attention as other IRAs because most custodians who offer IRAs (like Vanguard) only allow traditional investments at their firms. You can’t buy or sell property directly from yourself. You can’t lend money or borrow money from it. You can’t invest in a company you own or control. You can’t do business with a company you own or control (e.g. if you have a rental property in your IRA, you can’t have the rental property hire your landscaping company to trim the lawn). Another famously large IRA balance belongs to Mitt Romney, who purportedly holds over $100,000,000 of his wealth in an IRA. He’s never publicly revealed what investment are inside his IRA, but here’s my best guess. Mitt Romney is a private equity guy. That means he makes most of his money through carried interest. Carried interest is a tax loophole that everyone promises to close, but nobody does. Carried interest works like this: a private equity firm finds a company to purchase, say for $100M. Its limited partners put up $99M for the purchase, meanwhile the private equity firm adds the remaining $1M. In exchange for the $1M, the private equity firm enters into an arrangement with the investors where the private equity firm will take 20% of any profits achieved on the sale of the company. Five years later, the Company is sold for $300M. After returning the original equity to the partners, the private equity firm is left with a $200M profit. Forty million goes to the private equity firm and the remaining $160M is distributed to the limited partners as profits. The private equity firm may divide up the profit by only a few people. Let’s say it has four partners. Each will get $10M from the sale. If you assumed each paid ordinary income tax on the $10M profit, you’d be mistaken. Instead, they pay capital gains tax rates on their “carried interest” (the 20% cut of any profits). If Mitt Romney used his IRA to make an investment in the carry vehicle of the private equity fund, any profits he received from the carried interest would fall into the IRA. He could then use the larger balance in the IRA to make more investments in future deals. I imagine this is how he built up such a large IRA balance. Most lawyers should be focused on maximizing their retirement accounts and investing in index funds. The surest path to wealth is consistently saving money and getting market returns, which is what I’m currently doing. But, if you have access to investment opportunities in private companies, it’s worth considering whether your Roth IRA is the right vehicle for such an investment. Let’s consider an example. A friend of yours has started a niche manufacturing business selling a seasonal product. He has the product manufactured in China, imports it into the United States and then sells it at retail stores and through his own website. He’s looking for investment capital from you of $25,000 to help grow the business in exchange for a 1% ownership stake in the company. If you think the company is doing well and likely to make a profit, you can make the investment from your taxable account. Any dividends or gains will be taxed at capital gain rates, which are more favorable than ordinary income tax rates but can still be quite steep once you factor in the 3.8% tax for Obamacare and state tax rates for capital gains (usually ordinary income tax). On the other hand, if you make the investment through your Roth IRA, all dividends and gains will come back to you tax free. Keep in mind that if the company goes bust, you’ll lose everything and won’t be able to contribute the money back into your Roth IRA. This makes it risky since contributions to a Roth IRA can only be made once. However, the upside is also intriguing since you can avoid a large amount of taxes on a investment that does well. Clearly Peter Thiel and Mitt Romney believed in their investments enough to make them with tax-sheltered money. So, the thing to consider is whether you should put your moonshot investments in a Roth IRA. As far as I can tell, if you’re going to make a risky investment, it’s a reasonable place to consider. Let’s talk about it. What types of assets are you putting in your Roth IRA? Those are some robust balances. Maybe I should had considered doing this for the $105K check I have to write in January for equity in the company I work for. I saw you left a comment on my post today about investing through Prosper with a Roth IRA. I have had it on my list to research the particulars of the back door roth, but just haven’t made the time to get around to it. Maybe its finally time??? This sounds like the perfect time to consider it for the check you have to write. What’s a better investment than when you’re investing in your own company (so long as you don’t “control” that Company – you should read through the prohibited transactions). I wonder if any law partners have made their capital commitment via a Roth IRA. I’ll have to look into that. That’s cool, I didn’t know the gov released these statistics. As far as Peter Thiel investing in startups through a Roth IRA, I hadn’t heard that, but it makes sense. If part of your portfolio is going to be high risk, high returns (zero or many X multiple), it makes sense to do that with a Roth IRA. That way if you hit it big, it is untaxed. If it is worth zero, that isn’t really any worse that it going to zero in a normal account. Yeah, my thoughts exactly. If you hit a home run inside your Roth IRA that’s a pretty big deal. I think there is a downside that (slightly) offsets that upside; in a taxable account you can harvest the losses whereas you cannot in a Roth. If you’re looking at many X or bust your upside is unlimited and your lost harvesting is capped, but it’s probably not quite so simple because the expected risk-adjusted return should be the same (or similar enough…or you’d be making this type of investment as often as possible, pending portfolio diversity). Great article. Are you sure a general partner can use an IRA to satisfy its capital requirements/GP commitment in a fund? Wouldn’t that constitute a prohibited transaction, since he’s using his IRA to invest in a company he owns or controls? I’m sure the strategy works for limited partners, but it seems like the rules are different for a general partner, such as Mitt Romney in your example? No, I’m not sure. You might be right, as it looks like Mitt Romney is the general partner. I will need to investigate this further. Very tricky indeed! You have to wonder if more Roth accounts grow into the millions, if they will find a new way to tax it. If they do, it will be through some sort of stealth tax. I doubt they’ll tax it directly. But for now, I wouldn’t mind being in that club of 314. Crazy! That’s a lot of taxes that won’t be paid. Pales in comparison to my $45,000 Roth balance. Haha. I do know one guy who day traded in his Roth IRA – I would always give him crap for it, but then one day after a few beers he showed me his Roth balance in a “mine is bigger than yours moment”. He had almost $2 million in it from trading stocks in it for just 5 years. I was like WTF? Thanks for sharing Biglaw and congrats on your Rockstar feature. Whoah. I’m always skeptical of those stories. Did he start with a $3 million balance? Honestly. I don’t know what balance he started with and it realistically could have been some IRA that he inherited and then converted. But that truly was his Roth IRA balance. He pulled up his online account. I didn’t push any further – just a WHOAH either way, because even if he didn’t day trade it then a $2 million Roth IRA balance is still ridiculous. He’s a smart guy though so I think he figured something out, but it’s elusive to me. Now THAT’s a plan. Great idea. 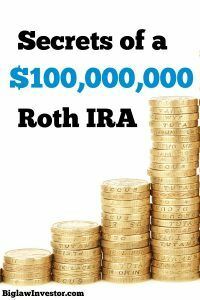 If you turn it into a Stretch IRA, you could send the Roth IRA to your grandkids and they wouldn’t be paying any taxes on the money another 50 years later. Great post. I had no idea these statistics were available. I knew I should’ve started investing in my first year of life ;-). Woah, interesting piece. Great fact to keep in my mind as I get old and have more capital to invest. Currently I am only putting higher yielding dividend stocks and REITs into my Rot to avoid paying ordinary taxes on the distributions. But never considered the possibility of alternative investments. Those are definitely some eye opening figures and it is insane to me that those profits will all be tax free when drawn from the account. I guess the penalty of withdrawing funds early is well worth the taxes you are not paying. This is a really interesting post! I’ve never thought about investing in businesses or private equity through a Roth IRA. I currently have a little over $100k sitting in a Roth IRA that is a rollover from a previous employer. It’s invested in some pretty straightforward funds. I never considered investing it in anything else. Very eye opening to the other options out there. Anyone here have the next Facebook that I can invest my Roth in?! I started a self-directed Roth IRA almost almost 7 years ago. It took about 5 months to set up (a lot of paperwork!) and I only funded it with a small amount of money. (I was cautious about the legality of them at the time and didn’t want to risk too much.) I been using it to invest in real estate via hard money loans since and have been reaping great tax-free returns since! Thanks for sharing your story. It seems like it could be a good option for real estate. I’m glad to see people thinking outside the box when it comes to Roth investments. If everything works out, you may never even need that money and can leave it to your heirs tax free. They’ll be glad grandpa paid the taxes back in the day. You did a great job explaining how carried interest works. I had never really understood that jargon. And, I had no idea you could make private investments via a ROTH IRA.